I am all about things that are quick and easy. If it’s a healthy, delicious dinner but I need to spend two hours in the kitchen to make it, it’s not going to happen. The same is true for meal prepping. With two young kids running around and a full time job, I just don’t have the time to carve out every Sunday spending hours preparing food for the week. Some people manage it, and they are awesome. I just can’t. 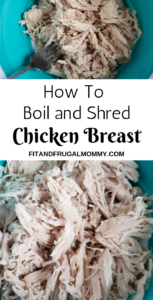 This is why I absolutely love shredded chicken. It’s versatile and fast. 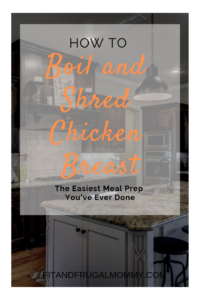 So, without further adieu, here is how to boil and shred chicken breasts. I love boiling chicken breast because it’s fast. I can essentially throw it in a pot with some seasonings and forget about it. (Within reason, don’t actually forget you have something on the stove of course!) Anything that is that easy I am all about. First, you will need to place the chicken breasts in the bottom of a pot. 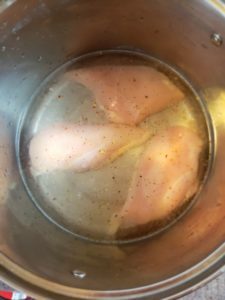 Cover the breasts with water so they are fully submerged and add seasonings. I personally am obsessed with the Roasted Garlic and Red Pepper spice. I will add it into the pot with some salt and pepper to taste and the chicken comes out sooo delicious. Next, bring the water to a boil. Once boiling, cover, and turn the heat down to medium-low. Cook for 15 minutes, or until fully cooked through. This time is for 2-3 chicken breasts. 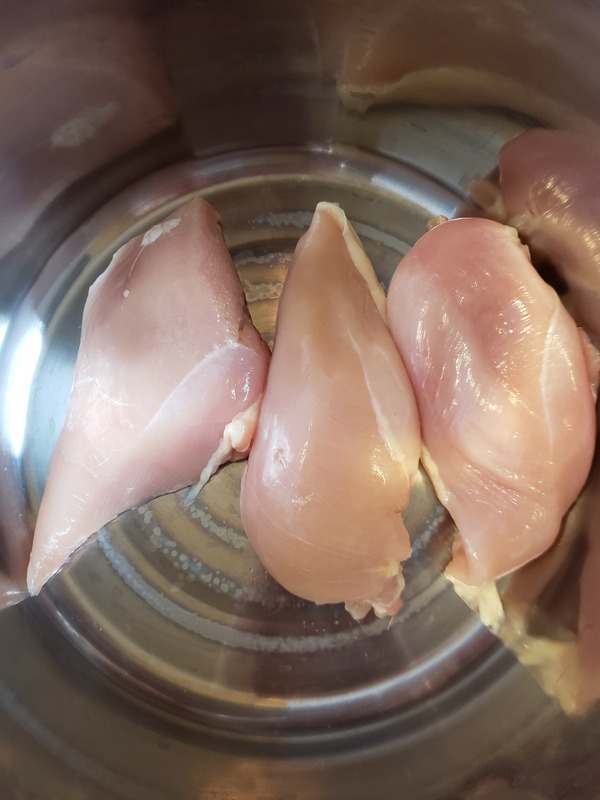 The more breasts you add, the more cook time you will need. Once the chicken is cooked through, you can strain the chicken and shred it with two forks. 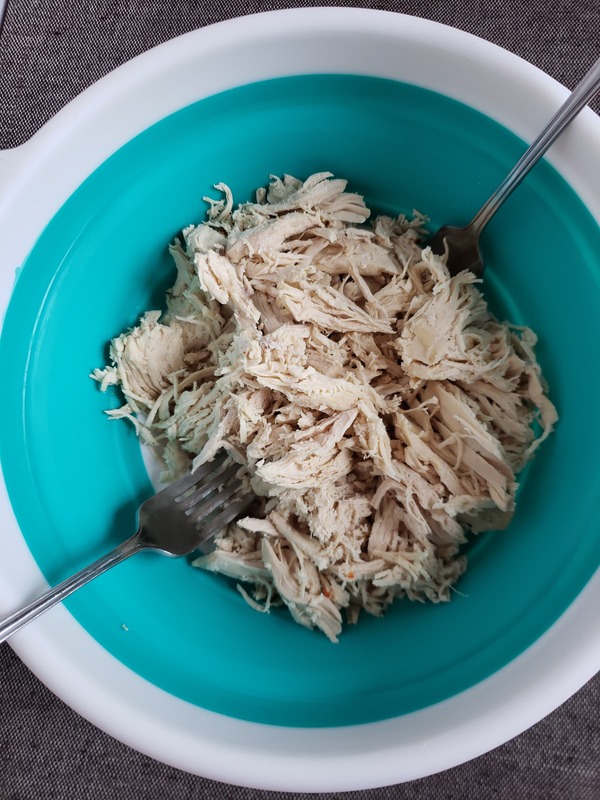 I absolutely love using shredded chicken in my weekly meal prep because it’s fast and easy. 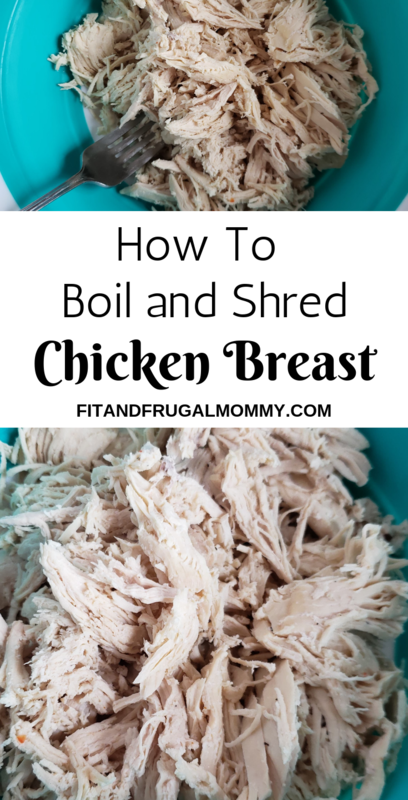 Shredded chicken also retains a lot of it’s juiciness in comparison to pan frying or baking. How can I use this meal prepped shredded chicken? Again, shredded chicken = love. Just in case you’re like me and you skipped through all of the above and are looking for the easy peasy recipe card, here it is! 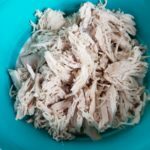 An easy shredded chicken recipe. Fast and healthy meal prep! Cover the chicken breasts in water, so they are fully submerged. Add seasonings to the water. Bring the water to a boil. Once boiling, cover and reduce to medium-low heat for 15 minutes or until chicken is cooked through. Once cooked, strain the chicken and shred with two forks.